Each year millions of Americans with mental illness struggle to find mental health care. Nearly half of the 60 million adults and children living with mental health conditions in the United States go without any treatment. People who seek treatment must navigate a fragmented and costly system full of obstacles. As a result, many people cannot access mental health care when they need it most. Despite the passage of the Mental Health Parity and Addictions Equity Act of 2008, significant barriers remain which keep many Americans from accessing mental health treatment and support. Americans are finding it difficult to access care for several reasons. People lack the same access to mental health providers as they have for other medical providers. And when they can find a mental health professional, many are forced to go out-of-network to do so. This leads to higher out-of-pocket costs for mental health care compared to other types of primary or specialty care. 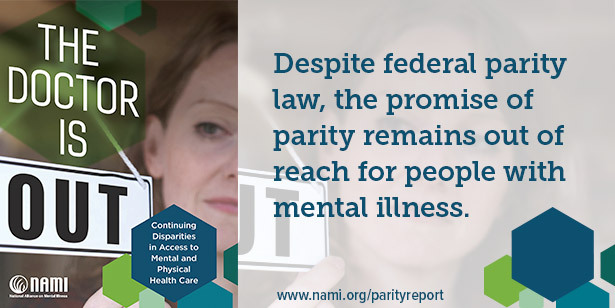 To assess whether federal and state parity laws were truly leading to equity in accessing mental health and substance use disorder care, NAMI has conducted a series of three surveys. Following the first survey in 2014, NAMI issued a report in April 2015, A Long Road Ahead: Achieving True Parity in Mental Health and Substance Use Care. The survey revealed that, despite the requirements of the federal parity law, people encountered significant barriers to receiving services. As a follow-up to the findings published in early 2015, NAMI released Out-Of-Network, Out-Of-Pocket, Out-Of-Options: The Unfulfilled Promise of Parity in 2016. 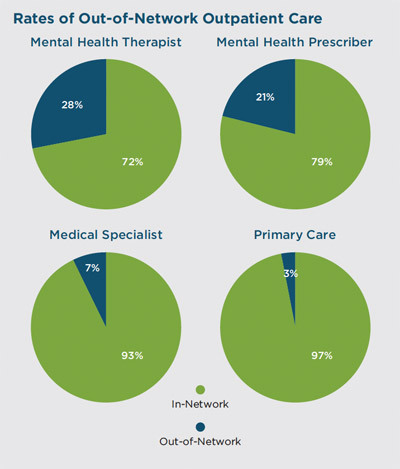 The report sought to answer the question, “What do insurance beneficiaries experience when they seek mental health care?” The report revealed that people with insurance had more difficulty locating in-network providers and facilities for mental health care compared to general or specialty medical care, whether for inpatient or outpatient services. Unfortunately, the most recent survey conducted in late 2016 revealed continued barriers for people to obtain mental health care. In the nationwide online survey, 3,177 individuals participated. These were individuals with mental health conditions or a relative who could provide reliable information. Participants in the survey could have coverage from either private health insurance or public health coverage such as Medicaid or Medicare. In The Doctor is Out, respondents indicated that they struggle to find a mental health therapist or prescriber. More than half of respondents who looked for a new mental health provider in the last year contacted psychiatrists who were not accepting new patients (55%) or who did not accept their insurance (56%). A third of respondents (33%) reported difficulty finding any mental health prescriber who would accept their insurance, either in- or out-of-network. 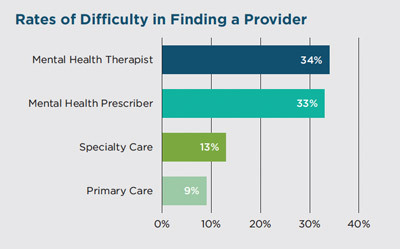 This far exceeded the number who had difficulty finding a medical specialist who would accept their insurance (13%) or a primary care provider (9%). When people cannot find a provider, many have to go out-of-network and pay high out-of-pocket costs, including co-pays. This happened at much higher rates than when seeking primary or even specialty medical care. Over 1 in 4 people (28%) receiving mental health therapy used an out-of-network therapist, compared to only 7% needing to use an out-of-network medical specialist. When people face higher out-of-pocket costs, it may lead to them seeking less care—or going without any care at all. Out-of-pocket costs exceeding $200 were more frequent for people visiting a mental health prescriber (16%) compared with visits to medical specialists (9%) or a primary care provider (6%). Survey respondents also reported difficulty finding in-network, inpatient mental health care. Of those who received psychiatric hospital care, over twice as many used an out-of-network hospital (12%) compared to those who used an out-of-network medical hospital for other types of medical care (5%). And, twice as many respondents (20%) had issues locating any inpatient psychiatric hospital compared to those who reported difficulty finding similar medical care (10%). Private insurance continues to be lagging. 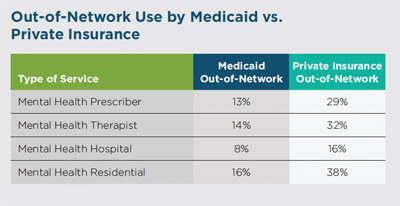 Medicaid recipients were far more likely to use in-network services than were people with private insurance. While more than two-thirds of the respondents enrolled in Medicaid reported no out-of-pocket costs for outpatient care, those who did incur out-of-pocket costs reported these expenses as more of an impediment to accessing mental health care compared to other medical or specialty care. Because of the substantial disparity in access to in-network mental health care and out-of-pocket costs compared to other types of medical care, NAMI believes it is crucial that state and federal regulators routinely conduct market audits of all commercial health insurers and Medicaid managed care organizations for compliance with federal parity law. These audits would help level the playing field for insurers who are doing the right thing—and ensure that individuals with mental illness can access the care they desperately need. Despite federal parity law, the promise of parity remains out of reach for people with mental illness. Overly narrow provider networks and high out-of-pocket costs are substantial barriers to individuals accessing mental health treatment. NAMI calls on health plans, regulators and lawmakers to take the necessary steps to address these disparities and ensure access to mental health care for millions of Americans.